In this article I will talk about the Tennis Forehand Grips and I am going to tell you about different Tennis Forehand Grips. Correct grip is very much needed if you wish to improve your forehand. Without correct grip you will not have an effective forehand. The purpose of this article is to explain you about different forehand grips and how to hold racquet for different grips. 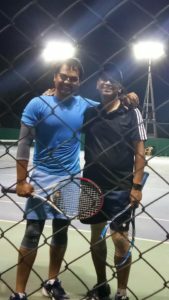 Tennis is a wonderful game and if you are in love with it like me and like millions other, your objective should be to improve as much as you can as this sport gives you a lot of opportunities to learn many new things. 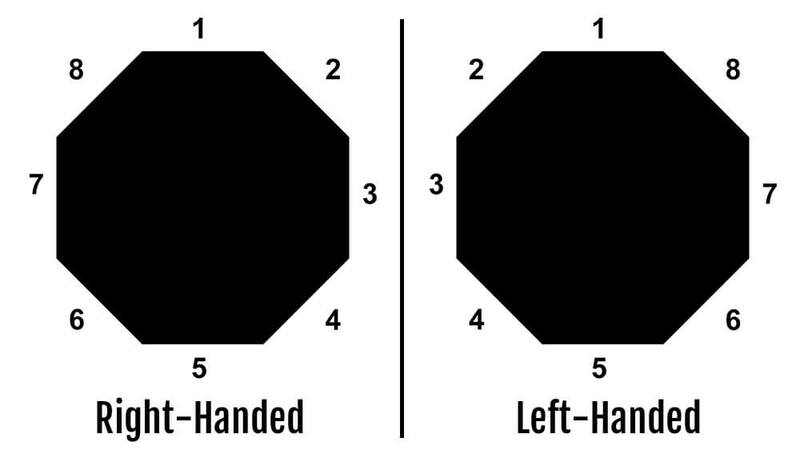 There are basically four Tennis Forehand Grips. I will explain about each of the grip in detail with pictures. First I will explain about types of grips and their pro and cons and later I will explain how to hold Tennis racquet for each grip. This group is for aggressive players. It gives you lot of power but very less top spin. However with a powerful forehand with Eastern Forehand Grip less top spin may not be a drawback. This grip will however not allow you long rallies as the ball is being hit faster and flatter which results in short rallies. This grip will allow you to hit more winners in comparison to any other grips. In the later part of the article I will explain you how to hold racket for Eastern Forehand Grip and other grips with the help of pictures. This is also a very popular Tennis Forehand Grip. This grip allows you to generate top spin. The face of the racquet remains towards ground due to this whenever you try to hit the ball, the racquet automatically brush up the ball while you swing the racquet. Such grip and swing allows you to hit the ball with lot of topspin. With the time and practice you can learn how to swing the racquet in the best possible manner to hit the ball with more top spin. I also use this grip and it has helped me to generate top spin. Semi Western Grip allows you to hit the ball higher over the net and still ball drops within court due to topspin. This allows long rallies and give you more time to adjust yourself during the game. However this grip is little bit difficult to master and you need to do lot of practice to become comfortable in holding the racquet with this grip. Practice swing is also very important part of this grip. Now let us discuss about Full Western Forehand Grip.You can generate massive topspin from this grip. But this is a difficult grip to master as holding position of racquet is quite difficult and lot of practice is required in holding the racquet. With this grip along with the top spin, the ball really jumps off the ground. This makes really hard for the opponent to judge and he is forced to stand much behind the baseline and it also gives you control over the game. However with the Full Western Forehand Grip it becomes harder to change your grip again and again when you are coming for a volley. I will not discuss about the continental grip here as this grip is outdated. This grip is too simple and no longer in use for forehand. However I will explain you how to hold racquet for this. Once you understand how to hold racquet for this grip you will know why I am saying that this grip is no longer in use for forehands. You can see here in this picture that the handle of a tennis racquet is in octagonal shape. The 8 sides are known as bevels. You can see that the bevels have been numbered to have better understanding. 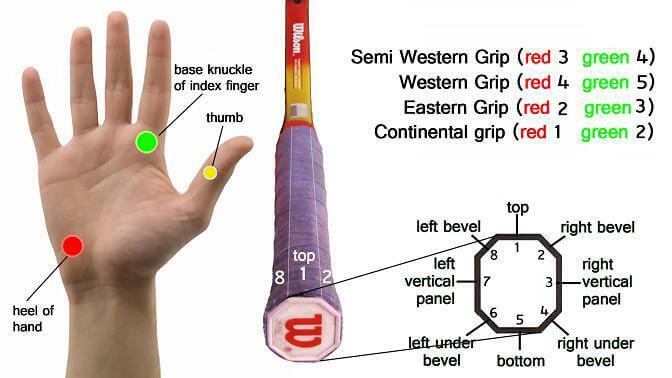 So you can see how simple it is to hold racquets in different Tennis Forehand Grips. Adopt a grip which suits to your game. Take the opinion of your coach or senior players and adopt the grip which suits you most.